Zimbabwe was Thursday on edge awaiting the results of its historic presidential election after troops opened fire on protests against alleged electoral fraud, denting hopes of a new era for the country following the ousting of Robert Mugabe. Monday’s polls — the first since autocratic president Mugabe was forced out by a brief military takeover in November — had been meant to turn the page on years of violence-marred elections and brutal repression of dissent. 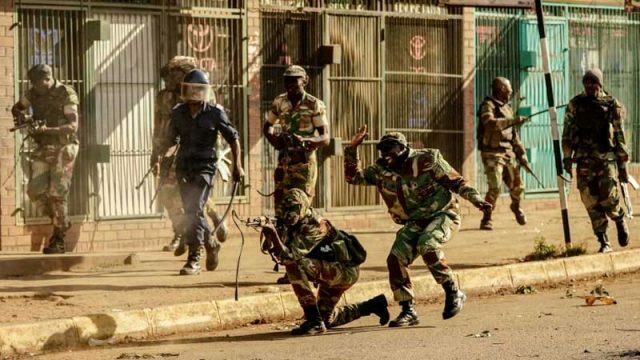 Soldiers fired on demonstrators during MDC protests in downtown Harare, AFP witnesses saw, with one man killed after being shot in the stomach. Official results Wednesday showed that the ruling ZANU-PF party had easily won most seats in the parliamentary ballot — strengthening President Emmerson Mnangagwa’s prospects of holding onto power in the key presidential race. Under Mugabe’s 37-year reign, elections were often marred by fraud and deadly violence. Partial results from the presidential race were expected Wednesday but in the end there was no announcement. The electoral commission warned that final results of the presidential first round may not be known until Friday or Saturday.